The Breathing Cycle is a description of the changes in pressure, lung volume, and airflow that occur during a single cycle of breathing. The major pressure gradient which controls expansion and contraction of the lung during the breathing cycle is that between the alveolar air and the intrapleural space; consequently, we will be focusing on this gradient. The breathing cycle can be divided into three basic stages including rest, inspiration, and expiration which are discussed separately below. As explained in Integrated Pulmonary Compliance, the lungs displays strong recoiling forces at FRC whereas the chest wall displays a tendency to spring outward. These opposing forces generate a negative pressure within the intrapleural space which is responsible for maintaining the lungs in an inflated state while at rest. If the negative intrapleural pressure were eliminated, say by raising it to that of atmospheric pressure as might occur in a pneumothorax, the lungs would collapse under their own recoiling force. During inspiration there is a net movement of air into the lungs and the volume of the lungs expands by the tidal volume above that of the Functional Residual Capacity (FRC). Given the inward movement of air, it is clear that the alveolar pressure must be slightly negative, thus dipping below that of atmospheric pressure and in consequence actuating inward airflow. During inspiration, the intrapleural pressure decreases also, dipping to -7 or -8 cm H2O below atmospheric pressure. This more negative intrapleural pressure is the result of the increasing recoiling force exerted by the lung as it expands. During expiration there is a net movement of air out of the expanded lungs and the volume of the lungs declines by the tidal volume back to the FRC. Given the outward movement of air, it is clear that the alveolar pressure must be slightly positive, thus increasing above that of atmospheric pressure and in consequence actuating outward airflow. During expiration, the elastic recoil of the lung declines as it contracts; consequently, the intrapleural pressure returns to its previous value of -5 cm H2O, thus reestablishing the original FRC lung volume. 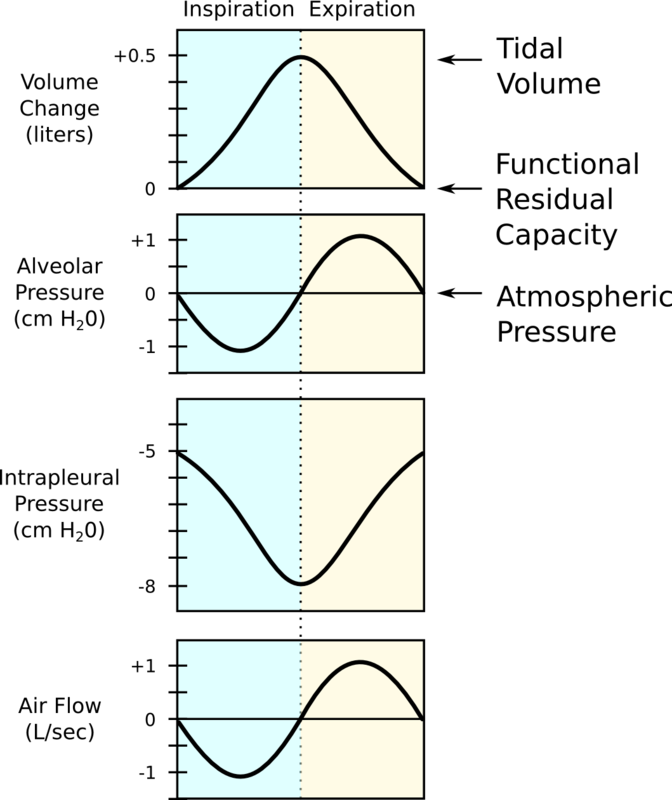 The above graphs show the relationships between inspiratory lung volume, alveolar pressure, intrapleural pressure, and airflow during a single cycle of breathing. Note how inspiration is achieved by generating increasingly negative intrapleural pressures.